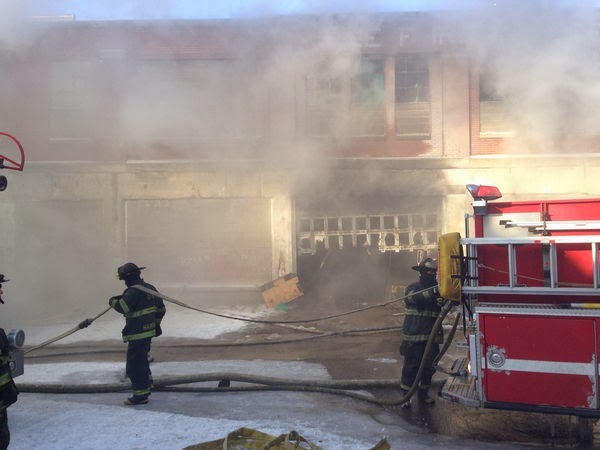 CLEVELAND, Ohio -- Firefighters braved near zero degree temperatures to tame a major fire ignited by construction crews at a former creamery, officials said. Crews arrived at the Fairmont Creamery building on Willey Avenue across from the Cleveland APL about 7 a.m. Friday, department spokesman Larry Gray said. Gray said the fire started on the building's third level. Workers converting the long-vacant creamery into apartments were thawing the heating source to large coolers with torches, and accidentally ignited one of the coolers, Gray said. According to this Crain's article, the developers are claiming that this will not affect the project's goals. Cleveland firefighters late Friday morning still were on the scene of the fire at the former Fairmont Creamery building and will be there through the early afternoon because substantial smoke and steam continues to stream out of the vacant structure, said Larry Gray, Cleveland Fire Department public information officer. The Fairmont Creamery will soon be converted to 30 residential apartments, 13,000 square feet of commercial space, and a 12,000 square foot athletic club. The property is expected to be fully leased and stabilized by spring of 2015 (but maybe that timeline will now be extended. Read more about the project here.